Conflict between disputing parties can almost always be resolved without having to go to court. Conflict resolution can either be informal and non-legally binding, or more structured in that they follow strict legal procedures. Arbitration-Mediation is one of the most common forms of conflict resolution methods, along with different kinds of negotiation methods that help organizations settle their disputes while avoiding more costly lawsuits and legal battles. These techniques focus on resolving the dispute and avoiding court, while keeping in mind the best interests of the parties involved. Our firm is one of the best corporate law firms in California. 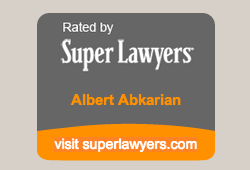 Our managing partner, Mr. Albert Abkarian is a court appointed Arbitrator and Mediator who has mediated and arbitrated thousands of disputes and cases in the past 22 years. He is highly respected in the field, offering expertise in handling different business, personal injury, real estate, and other types of civil disputes. Mr. Abkarian can also act as a discovery referee who can resolve disputes without court involvement. Call us today to find out more about arbitration and mediation settlements, discovery referee, corporate law, and other legal services that our award-winning firm has to offer.